"Liven up boring Brussels sprouts with this recipe! Adjust the type and amount of chile pepper to your taste." Place a steamer insert into a saucepan and fill with water to just below the bottom of the steamer. Bring water to a boil. Add Brussels sprouts, cover, and steam until tender, about 5 minutes. Sift chickpea and rice flour together in a large bowl; mix in coriander, cumin, baking powder, salt, and black pepper. Whisk in enough water until pakora batter is the consistency of pancake batter. Stir in Brussels sprouts, cilantro, and chile peppers until combined. 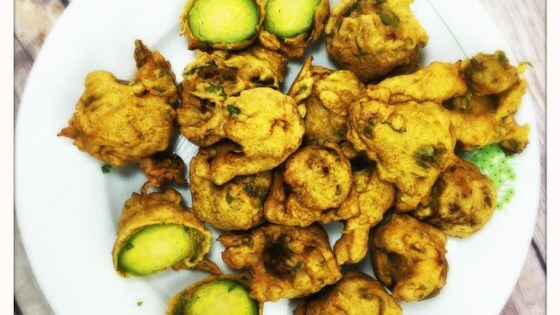 Scoop a few tablespoons of pakora batter at a time into the hot oil. Fry until golden, about 5 minutes. Very good. Makes lots. Used leftover batter on a fresh yellow pepper and fried. We will enjoy this again.